With the proliferation of hybrid cars, you can bet that pretty much any gas-powered anything will soon be available as a hybrid. 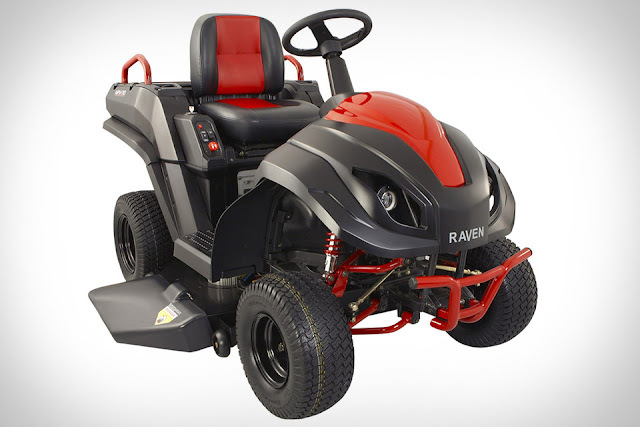 Take, for instance, the Raven Hybrid Riding Lawn Mower ($3,000). This impressive lawn tractor creates over 7,000 watts of electricity, features self-charging technology so you won't be doing any battery swaps, and can run for up to 12 hours on a single tank of petrol. It still needs to cut grass, of course, and for that it has a 46" quick-release cutting deck, ATV-style shocks for cutting on rough terrain, the ability to pull loads of up to 500 lbs, and a top speed of 17 mph — perfect in case you find yourself in a life-or-death lawnmower race.